Australian Festival Of South Asian Arts, PARRAMASALA, present Tamasha's THE TROUBLE WITH ASIAN MEN, created by Sudha Bhuchar, Kristine Landon-Smith and Louise Wallinger at Jubilee Hall, the Town Hall, Parramatta. So, says the blurb in the Parramasala 2012 Festival Guide. Beware. The title of this play is, in Australian terms, misleading, as a member of my audience pointed out in the preliminary to the performance hosted by one of the UK actors, Amit Sharma: Asian Men in Australia usually refers, vernacularly,that is, in the verbatim, to men from China, Vietnam, Thailand, Indonesia, Malayasia, Japan, etc. not to men from India. Indian men, here, in Australia, are usually described as Indian, Pakistani, Sri Lankan and Bangladeshi men as from Pakistani, Sri Lanka or Bangladesh. Not regarded, verbatim as Asian men. At least that is my impression, having lived here, mostly, in Sydney, all my life. This work was first performed in 2005. Its "critical acclaim" may have been, firstly because of its timeliness – seven years ago! (The Kumar's have been on TV since, even here in Australia, so most of what we learn, here, is both superseded and superfluous), and, secondly, because of its location of research (?! ), the UK. Maybe, one needs to be from the UK of seven years ago to find the material "hilarious". Maybe, one needs to be really stupid to find any of this material "insightful". THE TROUBLE WITH ASIAN MEN is, it is a dated, banal and alien work, except, perhaps, to the local expat's who may catch it, and sentimentalise, and is hardly worth the effort to import all the way from the UK, for many of the rest of us. Tamasha means 'commotion', creating a stir. If one cares to read the news item on artsHub Australia: Not As Asian As It Sounds, this production, from Tamasha, courtesy, supported, by the Arts Council England, might just be the cause of a bit of a further commotion. 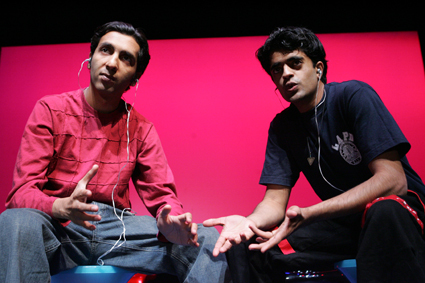 Tamasha is an award-winning theatre company which has played a key role in driving the crossover of Asian culture into the British mainstream. The company was founded in 1989 by director Kristine Landon-smith and actor/playwright Sudha Bhuchar. Successes like EAST IS EAST, STRICTLY DANDIA and THE TROUBLE WITH ASIAN MEN have won acclaim from audiences and critics alike. The company usually investigates personal stories of cultural difference and connection as rich and radical sources for theatre, nurturing today's unknown talent to become tomorrow's leading artists by delivering bespoke training and tangible professional opportunities with its Tamasha Training Artists (TDA) programme. On a bare platform stage with three chairs, three actors, two UK guests: Amit Sharma and Niall Ray and a local Aussie-American John Shrimpton (this role will be played variously, by other local guests), sit on three 'found' chairs, dressed as themselves in, I supposed, their own 'verbatim' street clothes, no design attached, in a cursory lighting state. This is a No-Frills production. Except, for the sound tapes, I mean, NO FRILLS. It is a deliberate "not theatre experience" (except it is, of course!). The Jubilee Hall, the performance venue, has no air conditioning and is barely adapted for the needs of the audience. It took me back to the late seventies when most theatres did not have many comforts. Not a pleasant memory to experience. Summer is on its way- humidity, plus! The 'gimmick' of this work is that the verbatim interviews have been recorded and in what is called Headphone-Verbatim (Playback-Verbatim), developed by British Director, Mark Wing Davey, in which the actors, with head sets on their ears, speak the lines with the recorded voices, with all the pauses, inflexions etc. in tact. (Sound Design, Mike Furness). It is a form that we in Sydney are very familiar with. Urban Theatre Project and Roslyn Oades, for example, has developed many works using this process for some time now: FAST CARS & TRACTOR ENGINES (2005), STORIES OF LOVE AND HATE (2008), I'M YOUR MAN (2012) ). John Shrimpton who has worked with the Urban Theatre Project is quite accomplished with the demands of the presentation, and quite the most impressive of the three actors: comfortable with himself and the material and the audience that is hearing it -as banal as the material may be. The other two actors, though no less skilful, appear to be sorting out a response to the work from an Australian audience, that is not quite, perhaps, what they are used to in the UK - not quite as hilarious as they may be used too?!. What we do discover here in this set of verbatim interviews is essentially, that South Asian Men are really mummy's boys and they have an arrogance that some may think is macho, others, just emotional retardation/immaturity. If you need other insights or sources of hilarity into this culture, this is not the show for you. After the visit by DV8 with their show CAN WE TALK ABOUT THIS, last year, also from the UK, also using Verbatim techniques, THE TROUBLE WITH ASIAN MEN may appear to be neither "rich" nor in the least way "radical" - a more middle-class, bourgeois evening you could not find. Unlike the DV8 experience, this audience scattered home with no reason at all to gather and talk about any of the "hilarious" and "insightful" text, "rich" or "radical" Tamasha theatre production techniques! in the foyer. There are 35 characters in this work. 12 of them are women. That the cast is made up of three men, with no woman on stage, may be as telling a piece of 'radical' theatre in 2012 as I could argue, from this experience. No way in Australia today, I would imagine, I hope, would anyone dare to present this casting. Ms Landon-Smith, who is of Australian origin, has been away from this country too long it seems- completely out of touch with the Australian performing arts culture and its practice. Did any of the organisers of this Festival see this work, or, as it is in print, I have a copy, read it, before inviting it to this Festival? Rather, I suggest, give the money budgeted for this presentation, transport (return air fares to UK for at least three I imagine! ), accommodation and all, and commission a local company to develop an Australian/South Asian contemporary, more relevant work. That this "critically acclaimed" production in the UK can get away with this casting and material, in 2012, tells you something about the culture over there, perhaps? Of the management culture of Parramasala? There is, as THE AUSTRALIAN reported yesterday, (November, 8th) in their Arts pages, "new content from research conducted in Western Sydney", included in this performance. This additional research has been procured by Drew Fairley, and that it is only three interviews, and from a limited resource of friends of the company does seem to me, to overstate the claim in the newspaper: "...research conducted in Western Sydney"! Research?!!! "Spin, baby, spin". It is palpable rubbish. A fob to the organisers and supporters of the importation of this production? MMMM? Kristine Landon-Smith, the director of this work is also holding workshops for you to "discover all there is to know about 'verbatim theatre'". If you can't make it, just check out, Urban Theatre Projects or talk to the award winning Australian playwright, Alana Valentine, who has specialised in this work for a very long time. They might be able to also tell you all that there is discover about, 'verbatim theatre' in an up-to-date Australian cultural context. THE TROUBLE WITH ASIAN MEN is a shocker, and a bit of an embarrassment to be seen as part of a very important cultural development and head -lined in the more advantageous time, 7.30pm. On the other hand, you might want to catch Ansuya Nathan in her show that follows in the same uncomfortable venue, Jubilee Hall at 9.00 pm: LONG LIVE THE KING.